Of the "Big Four" orders of the Insecta (Coleoptera, Lepidoptera, Hymenoptera, and Diptera), the Lepidoptera (moths, and the diurnal moths known as "butterflies") are reputed as the most-studied and best-understood (Gaston, 1991). I have observed that this reputation (which results from the enduring appeal borne by those ever-popular insects, the Papilionoidea) is often held without question amongst the entomologically inclined—unfortunate, given its falsehood: the excellent systematic knowledge of the butterfly/macro-moth* faunas of a few scattered regions in the Northern Hemisphere is by no means a synecdoche for the state of that field with regard to the remainder of the order's constituents (Kristensen et al., 2007). 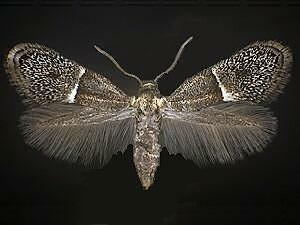 The micro-moths (as the non-Macrolepidoptera* are termed), which constitute the majority of the Lepidoptera, remain undoubtedly neglected in the realm of description and taxonomy. This neglect can be imputed to many factors, only one of which I choose to address here: the structural and ecological uniformity of the clade Ditrysia, which, as its members constitute the vast majority of lepidopteran species, unavoidably reflects on the order as a whole—uniformity relative to the trio of coevally speciose orders mentioned earlier, that is. Seeming consistency in gross ditrysian ethology belies an overall profusion of ecological detail amongst them—such as the specialization to host plant often seen herein (of which the moth shown above is a prime example; Harrison, 2005). But this consistency retains an essence of truth in that imaginal† ditrysians are overwhelmingly non-feeding or nectarivorous, and soft herbivorous tubes as larvae: to quantify, the latter characteristic is applicable to 99% of lepidopterans (Pierce, 1995). This essential reality has deterred research into Lepidoptera: to a degree, the order is seen as a dull option for study in the eyes of some entomologists. But there are many exceptions to this rule of homogeneous lepidopteran ecology: rather than feed on pollen or seeds as do most members of their genus, the inchworms within Eupithecia endemic to Hawaii are equipped with tarsal motion-attenuated sensillae and elongated claws, both used to pounce upon small prey (Montgomery, 1983); predation on auchenorrhynchans has also been observed in the caterpillars of one metalmark butterfly (Riodinidae; DeVries et al., 1992), nor can I possibly ignore the famed diversity of ant-larva-chowing myrmecophilous caterpillars among the riodinids and the closely related Lycaenidae (blues, hairstreaks, etc.) (Fiedler, 2012). Nor are predaceous larvae limited to the Macrolepidoptera: the caterpillars of certain Pyralidae are known to attack scale insects (Mann, 1969; Neunzig, 1997); and as a bagworm (Psychidae), the Panamanian Perisceptis carnivora possesses a protective case: but being a non-herbivore, it crafts its case from the remains of its prey (Davis et al., 2008). However, I primarily wrote this post with the intent of addressing the protelean parasitoids‡ among the Lepidoptera. Considering the diversity of the order (~174,000 spp. ), it is no wonder that this mode of existence has evolved on multiple twigs of the lepidopteran phylogram: but it is equally remarkable—given this same diversity—that less than 0.15% of these species are parasitoids (Pierce, 1995). Although I can find no comprehensive enumeration of the number of butterflies and/or moths which exhibit the parasitoid syndrome, it does appear that such adaptations tend to originate at species level: the parasitoid of paper wasp larvae (Polistes spp.) Chalcoela pegasalis (Hodges et al., 2003) is classified within a family largely consisting of humdrum phytophages (Crambidae), as are the gelechioids Euclemensia bassettella (Cosmopterigidae) and Zenodochium coccivorella (Blastobasidae) (although blastobasid caterpillars tend more towards detritovory; Watson & Dallwitz, 2011); the hosts of both these latter moths are scale insects (Coccoidea) (Rau, 1941). This taxonomic artifact is at odds with what is observed in another mega-diverse insect order with a scarcity of parasitoids: the Coleoptera (beetles). Only one parasitoidal lineage of these famously speciose elytron-bearers is ranked at or below generic level: namely, the genus Aleochara (Staphylinidae: Aleocharinae), which with the exception of one species, are larval ectoparasitoids of cyclorrhaphous fly pupae (Peschke & Fuldner, 1977; Peschke et al., 1996). Contrastingly, there are only two exclusively parasitoidal lepidopteran families: the related Epipyropidae and Cyclotornidae (both classified within the superfamily Zygaenoidea). Epipyropids are the more speciose of the pair, and most diverse in the Oriental and Australasian ecozones (only one species is known from my native Nearctic; Covell, 2005); their hosts are planthoppers (Fulgoroidea). 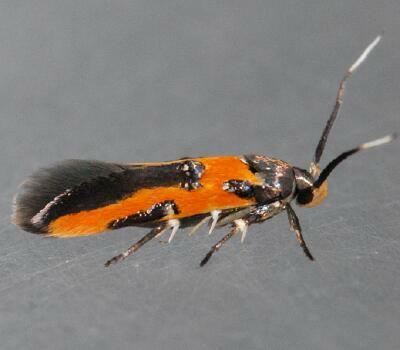 One species (Agamopsyche threnodes) is parthenogenetic (Perkins, 1905). Similarly to such unrelated insects as strepsipterans (not to mention mantispids and acrocerids), "planthopper parasite moths" are hypermetamorphic, with all of the attributes that this lifestyle entails: a dispersal stratagem necessitating copious broods (3,000 eggs per brood in Fulgoraecia sp. ), the hatching of which may be staggered to increase chances of larvae locating hosts (Kirkpatrick, 1947); in their inaugural instar, these dispersive larvae have disproportionately large heads and thoraxes, along with tapering abdomens—upon reaching a planthopper and adhering to its abdomen with its claws, an epipyropid larva moults into a dorsally convex and heavily corrugated caterpillar which exudes an increasingly thick layer of white polyethylene-like paraffin (Marshall et al., 1977), sucking its host's innards with serrated needle-mandibles on a head that can be retracted into its owner's obese body. Cyclotornids (consisting of five Australian species within the genus Cyclotorna; Common, 1990) exhibit strong ontogenetic parallels with the Epipyropidae. Female moths spread their eggs adjacent to ant trails (in Cyclotorna monocentra, those created by the dolichoderine Iridomyrmex purpureus); the miniscule first-instar larvae (of similar proportions to their epipyropid cousins) literally gallop along these thoroughfares (Common, 1990), which lead to aggregations of leafhoppers (Cicadellidae) farmed by I. purpureus. 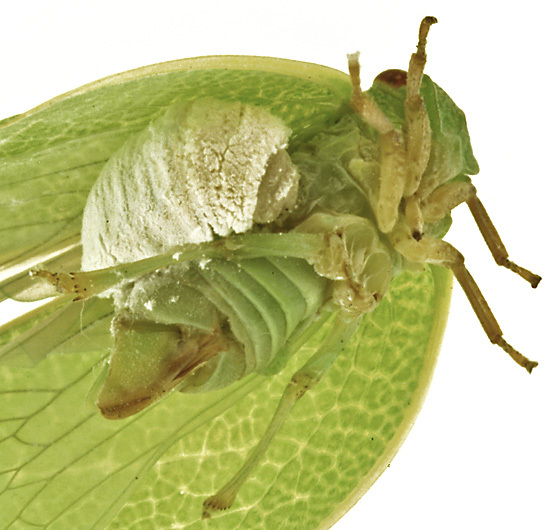 These cicadellids serve as initial hosts, the cyclotornid larvae oriented upon them similarly to epipyropids upon planthoppers (situated upon the abdomen below the wings): later instars (flattened and broad by comparison to the first) detach from their leafhopper hosts: exuding allomones attractive to the leafhopper-attending ants, the larvae are then borne back to the I. purpureus colony, where they reside as myrmecophiles; appeasing their hosts chemically whilst preying on the latter's brood before pupation in what is one of the more complicated ecological transitions any insect undergoes through metamorphosis (Dodd, 1912). To conclude, not all the Lepidoptera are so uninteresting (or so deeply understood) as their repute would lead us to believe. *The Macrolepidoptera is a probably monophyletic (Minet, 1991) clade including not only the butterflies (Papilionoidea) and the related skippers (Hesperioidea), but also such familiar moth families as the Geometridae (inchworms), Sphingidae (sphinx moths), the diverse Noctuidae (owlet moths and others), among many. ‡That is, parasitoids only when immature. Common, I. F. B. (1990). Moths of Australia. Melbourne: Melbourne University Press. Covell, C. V. (Jr.) (2005). A Field Guide to Moths of Eastern North America. Martinsville: Virginia Museum of Natural History. DeVries, P. J.; Chacon, I. A.; and Murray, D. (1992). Toward a better understanding of host use and biodiversity in riodinid butterflies (Lepidoptera). Journal of Research on the Lepidoptera, 31(1-2), 103-126. Dodd, F. P. (1912). Some remarkable ant-friend Lepidoptera. Transactions of the Entomological Society of London, 1911, 577-590. Gaston, K. J. (1991). The magnitude of global species richness. Conservation Biology, 5, 283-296. Hodges, A.; Hodges, G.; and Espelie, K. E. (2003). Parasitoids and parasites of Polistes metricus Say (Hymenoptera: Vespidae) in northeast Georgia. BioOne, 96(1), n.p. Minet, J. (1991). Tentative reconstruction of the ditrysian phylogeny (Lepidoptera: Glossata). Entomologica Scandinavica, 22, 69-95. Neunzig, H. H. (1996). The Moths of North America North of Mexico, fasc. 15.4.: Phycitinae (part). Bakersfield: the Wedge Entomological Research Foundation. Perkins, R. C. L. (1905). Leaf-hoppers and their natural enemies (Pt. II: Epipyropidae) Lepidoptera. Bulletin of the Hawaiian Sugar Planter's Association Experimental Station Entomological Series, 84(1), 75-85. Peschke, K. and Fuldner, D. (1977). Uebersicht und neue Untersuchungen zur Lebensweise der parasitoiden Aleocharinae (Coleoptera; Staphylinidae). Zoologische Jahrbuecher (Systematik), 104, 242-262. Peschke, K.; Mittmann, B.; and Fuldner, D. (1996). Aleochara clavicornis, a stepping stone in the evolution of parasitoid behavior within the rove beetle genus Aleochara (Coleoptera, Staphylinidae). Proceedings of the XXth International Congress of Entomology, Firenze, August 25-31. Pierce, N. E. (1995). Predatory and parasitic Lepidoptera: carnivores living on plants. Journal of the Lepidopterists' Society, 49, 412-453.